Omni Circuit Boards is your source for superconducting cryogenic PCB manufacturing. If you need reliable superconducting PCBs or PCBs for aluminum wire-bonding, please contact us. We are familiar with the thermal properties of our PCBs down to millikelvin temperatures, the challenges of thermal cycling, and making superconducting connections to our PCBs. We are the proud manufacturer of the cryogenic PCBs found in D-Wave quantum computers. These PCBs have operated flawlessly at temperatures down to 10 mK, and have remained in service for years. You can continue reading more about Superconductive PCBs below ↓. Aluminum-Trace Printed Circuit Boards provide the design solution to challenges faced with low temperature superconductive circuit boards and applications where the radiation-absorption properties of aluminum can be exploited. By successfully developing a process of chemically milling circuit boards with an aluminum circuitry, we are able to provide a design solution to a number of unique applications previously constrained by conventional PCB materials and processes. 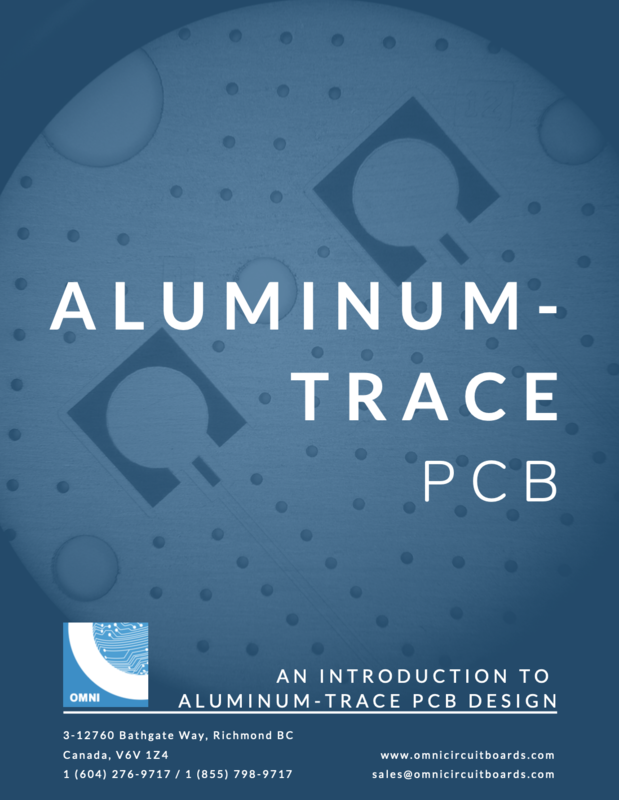 The process of producing PCBs with aluminum circuitry is unique and different from the commonly known "Aluminum PCBs", reason why we refer to them as "Aluminum-Trace PCBs". The aluminum circuit begins with ultra-thin sheets of 30 µm aluminum foil. Depending on the customer's requirements a mere 5 µm film of copper can be layered between the aluminum and dielectric to enhance the thermal conductivity of the device. A 5 µm copper layer can also be provided on pads on the top side to enhance solderability. These layered sheets are laminated together to customer specific configurations. After machining, a series of processing stages produce the fine lines and finally the solder mask and silk screening artwork is provided. The end product is a printed circuit board with fine-line aluminum traces and solderable aluminum pads which in turn make them superconductive, this is what makes "Aluminum-Trace PCBs" special. The design guide below is a current state of the capabilities for which we have process control, however, more has already been achieved and is under the prototype stages. Minimum printed circuit board size 0.10"x 0.10"
Maximum printed circuit board size 12" x 16"
Smallest drill size (final diameter) 0.010"
Smallest spacing between drilled holes (drill edge to drill edge) 0.010"
Available routing diameters 0.0315" up to 0.0940"
Smallest radius (inner corners) 0.01575"
Smallest routed slot width 0.0315"
Solder mask clearance to metal 0.002"
Smallest solder mask web (round) 0.004"
Smallest solder mask web (straight) 0.006"
Minimum clearance to unmasked aluminum 0.005"
Smallest distance between lines 0.005"
Max. offset drill centre to centre of reference 0.002"
Smallest space distance 30µm aluminum 0.003"
Smallest space distance 40µm aluminum 0.004"
V-Score position to aluminum features 0.015"